BACKGROUND AND PURPOSE: Primary atypical teratoid/rhabdoid tumors (AT/RTs) are rare malignant intracranial neoplasms, usually occurring in young children. The objectives of this study were to characterize the MR imaging features and locations of primary intracranial AT/RTs, to determine the frequency of disseminated disease in the central nervous system (CNS) at diagnosis and postoperatively, and to assess patient outcomes. METHODS: The preoperative cranial MR images of 13 patients with AT/RTs were retrospectively reviewed for evaluation of lesion location, size, MR signal intensity and enhancement characteristics, and the presence of disseminated intracranial tumor. Postoperative MR images of the head and spine for 17 patients were reviewed for the presence of locally recurrent or residual tumor and disseminated neoplasm. Imaging data were correlated with patient outcomes. RESULTS: Patients ranged in age from 4 months to 15 years (median age, 2.9 years). Primary AT/RTs were intra-axial in 94% of patients. The single primary extra-axial lesion was located in the cerebellopontine angle cistern. AT/RTs were infratentorial in 47%, supratentorial in 41%, and both infra- and supratentorial in 12%. 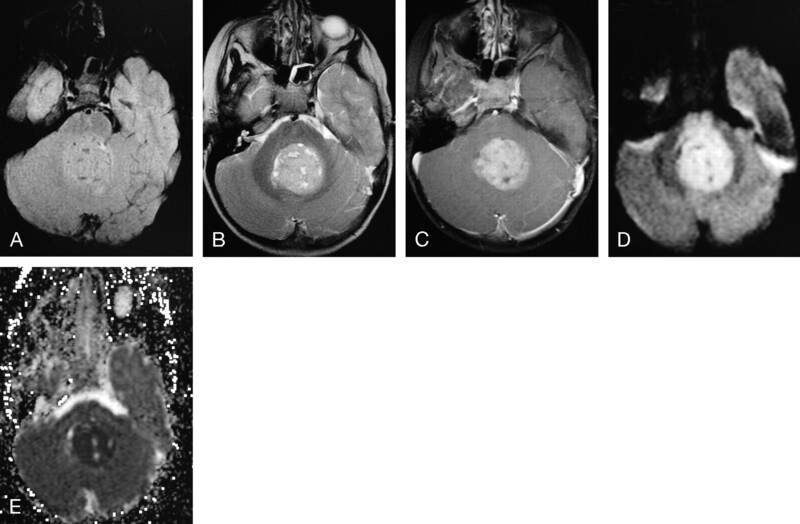 A germ-line mutation of the hSNF5/INI1 tumor-suppressor gene was responsible for the simultaneous occurrence of an intracranial AT/RT and a malignant renal rhabdoid tumor in a 4-month-old patient. Mean tumor sizes were 3.6 × 3.8 × 3.9 cm. On short TR images, AT/RTs typically had heterogeneous intermediate signal intensity, as well as zones of low (54%), high (8%), or both low and high (31%) signal intensity from cystic and/or necrotic regions, hemorrhage, or both, respectively. On long TR/long TE images, solid portions of AT/RTs typically had heterogeneous intermediate-to-slightly-high signal intensity with additional zones of high (54%) or both high and low signal intensity (38%), secondary to cystic and/or necrotic regions, edema, prior hemorrhage, and/or calcifications. AT/RT had isointense and/or slightly hyperintense signal intensity relative to gray matter on fluid-attenuated inversion-recovery (FLAIR) and long TR/long TE images, and showed restricted diffusion. All except 1 AT/RT showed contrast enhancement. The fraction of tumor volume showing enhancement was greater than two thirds in 58%, between one third and two thirds in 33%, and less than one third in 9%. Disseminated tumor in the leptomeninges was seen with MR imaging in 24% of patients at diagnosis/initial staging and occurred in another 35% from 4 months to 2.8 years (mean, 1.1 years) after surgery and earlier imaging examinations with negative findings. The overall 1-year and 5-year survival probabilities were 71% and 28%, respectively. Patients with MR imaging evidence of disseminated leptomeningeal tumor had a median survival rate of 16 months compared with 149 months for those without disseminated tumor (P < .004, logrank test). CONCLUSION: AT/RTs are typically intra-axial lesions, which can be infra- and/or supratentorial. The unenhanced and enhanced MR imaging features of AT/RT are often variable secondary to cystic/necrotic changes, hemorrhage, and/or calcifications. Poor prognosis is associated with MR imaging evidence of disseminated leptomeningeal tumor. The objectives of this study were to characterize the MR imaging features and locations of primary intracranial AT/RT, to determine the frequency of disseminated disease in the CNS at diagnosis and during postoperative surveillance MR imaging, and to assess patient outcomes. We reviewed the tumor registry files and surgical and pathologic reports from 3 medical centers and found records of 17 patients who had resection of primary intracranial AT/RT from 1991 to 2001. Thirteen patients had preoperative MR imaging examinations of the head. Seventeen patients, including the 13 patients with preoperative MR imaging, had postoperative staging and surveillance MR imaging of the spine and head. The study group consisted of 10 male and 7 female patients (Table 1). At the time of diagnosis, the patients ranged in age from 4 months to 15 years (mean age, 3.7 years; median age, 2.9 years). Fifteen patients (88%) were younger than 7 years at diagnosis, including 8 who were 3 years of age or younger. By surgical report, 6 patients (35%) had gross total resection of AT/RT, 5 (29%) had subtotal resection (> 75% reduction in tumor size), 3 (18%) had partial resection (25%–75% reduction), and 3 (18%) had undergone biopsies. Five patients had undergone postoperative chemotherapy, 1 patient was treated with radiation, and 9 patients experienced both chemotherapy and radiation. MR imaging was performed at 1.5T. Thirteen patients had preoperative contrast-enhanced MR imaging of the head. Multisection spin-echo pulse images were obtained in all MR imaging of the head and included short TR/short TE (400–800/9–22/1–2 [TR/TE/excitations]), long TR/short TE (2000–3200/15–30/1–2), and long TR/long TE (2000–6000/70–132/1–3) images. Fluid-attenuated inversion recovery (FLAIR) (9000–10 000/120–148/2200 [TR/TE/TI] images were obtained in 6 patients. Echo-planar diffusion-weighted images (DWI) were obtained in 4 patients and were acquired with b values of 1000 seconds/mm2 in 3 orthogonal gradient directions. Apparent diffusion coefficient (ADC) images were also generated to assess false-positive nondiffusion-related effects on DWI. Single-voxel (n = 1) and multivoxel (n = 2) proton MR spectroscopy was performed on 1 AT/RT before surgery and 2 residual tumors by using spin-echo point-resolved sequences (1000–1600/135–144 [TR/TE]) with volumes of interest ranging from 8 to 16 mL. MR imaging was performed in all patients after IV administration of gadopentetate dimeglumine or gadoteridol (0.1 mmol/kg) by use of short TR/short TE sequences (400–800/11–22/1–2). The preoperative cranial MR images of AT/RTs were evaluated for location, lesion size, MR signal intensity (low, intermediate, high, or mixed), signal intensity relative to gray matter on FLAIR and long TR/long TE images, contrast-enhancement features (degree: mild, moderate, or prominent; extent: small [less than one third], intermediate [one third to two thirds], or large [more than two thirds]; and pattern: heterogeneous or homogeneous). The presence of disseminated disease in the leptomeninges at diagnosis was assessed. Signal intensity of AT/RTs on DWI and ADC images was compared with that in noninvolved portions of brain parenchyma. Preoperative CT scans were also available for review for 6 patients. A total of 65 contrast-enhanced postoperative MR imaging studies of the spine and 121 contrast-enhanced postoperative MR imaging studies of the head were reviewed. The unenhanced and contrast-enhanced postoperative short TR images of the spine were evaluated for enhancement in the pial-subarachnoid space. Postoperative MR images of the head were evaluated for lesions or abnormal enhancement in the brain parenchyma, ventricles, leptomeninges, and dura. All MR images were reviewed by 2 neuroradiologists with subsequent correlation to the reports of the examinations from each institution. Results from CSF histopathologic examinations were available for 15 of the 17 patients. A total of 54 CSF samples were obtained after surgery. Thirty-three of the CSF samples were contemporaneous with MR imaging (ie, obtained within 3 weeks of MR imaging examinations; mean, 7.2 days; median, 5 days). Results of CSF histopathologic analysis were compared with those of contemporaneous MR imaging examinations in the assessment for disseminated leptomeningeal tumor and patient outcomes. Information pertaining to case demographic and clinical data are given in Table 1. Tables 2 and 3 list the immunoreactivity profiles and imaging findings of AT/RT, respectively. All specimens of AT/RT had histologic evidence of rhabdoid cells. Necrosis and hemorrhage were described in the reports of 10 and 4 lesions, respectively. Immunoreactivity results of tumor specimens to monoclonal antibodies are listed in Table 2. Positive reactions of antibodies to vimentin, epithelial membrane antigen (EMA), and actin (which are 3 epitopes typically expressed by rhabdoid tumor cells in AT/RT) were observed in 100%, 100%, and 83%, respectively. Reactivity to the primary neural antibodies, neurofilament protein (NFP), and glial fibrillary acidic protein (GFAP) was observed in 50% and 87%, respectively. Monosomy of chromosome 22 was found in 2 of 3 AT/RTs tested for tumor karyotypes. The other patient had a constitutional ring chromosome 22 with loss of the distal part of the long arm containing the 22q11.2 locus. Deletions and/or mutations of the tumor-suppressor gene hSNF5/INI1 in chromosome 22 were found in all 7 AT/RTs tested. In addition, 3 patients had germ-line mutations involving the hSNF5/INI1 gene, including a 4-month-old patient who had synchronous intracranial AT/RT and a malignant rhabdoid tumor in the left kidney. The intracranial tumor showed immunoreactivity to GFAP and NFP, whereas the malignant renal rhabdoid tumor did not. All 4 AT/RTs tested showed no nuclear staining for the hSNF5/INI1 gene product, indicating inactivation of both hSNF5/INI1 tumor-suppressor genes. The locations of AT/RTs are listed in Table 1. Eight (47%) of AT/RTs were infratentorial (Figs 1–3), 7 (41%) were supratentorial (Figs 4, 5), and 2 were both infra- and supratentorial (12%) via contiguous extension (Fig 6). The cerebellum was the most frequent infratentorial location. The 2 lesions that were both infra- and supratentorial primarily involved the pineal gland and dorsal midbrain, with some extension into the cerebellum (Fig 6). Of the supratentorial lesions, the frontal lobe was the most frequent site (Fig 4). AT/RT is typically intra-axial (94%) except for 1 extra-axial lesion located in the cerebellopontine angle cistern (Fig 7). At surgery, the extra-axial lesion was found to extend into the porus acousticus and was adherent to the dura laterally, the seventh and eighth cranial nerves inferiorly, and the brain stem medially. Intraventricular extension of primary AT/RT was found into the third ventricle (n = 1), fourth ventricle (n = 3), third and fourth ventricles (n = 2), and lateral ventricle (n = 1) (Figs 1, 2, 5, and 6). At the time of diagnosis and initial staging, 4 (24%) of 17 patients had MR imaging evidence of disseminated tumor in the leptomeninges (Fig 3). One patient had evidence of tumor in the intracranial leptomeninges, and 3 had evidence of disseminated tumor in both the spinal and intracranial leptomeninges. A 4-month-old patient with intracranial AT/RT involving the pineal gland, tectal plate, and vermis (Fig 6) also had a contemporaneous malignant rhabdoid tumor in the left kidney. MR images of a 2-year-old girl with a germ-line mutation of the hSNF5/INI1 gene and AT/RT in the vermis extending into the fourth ventricle. A, Sagittal (TR/TE, 520/10) MR image shows the tumor to have intermediate and low signal intensity. The tumor invades the dorsal brain stem. B, Axial (TR/TE, 5700/90) MR image shows the tumor to have heterogeneous intermediate-to-slightly-high signal intensity that is slightly hyperintense relative to gray matter, as well as zones of high signal intensity representing cystic/necrotic regions. Abnormal high signal intensity is also seen in the dorsal pons and left middle cerebellar peduncle, consistent with tumor invasion. C, Axial (TR/TE, 680/22) MR image shows the tumor to have solid-enhancing and nonenhancing cystic/necrotic components. Irregular enhancing margins of the lesion are seen at the dorsal pons and left middle cerebellar peduncle, consistent with tumor invasion. This patient died 1.6 years after diagnosis from locally recurrent and disseminated tumor. D, Axial CT image shows the solid portion of the AT/RT to have attenuation slightly higher than that of gray matter. Low-attenuation cystic/necrotic zones and several tiny calcifications are also present. MR images of a 10-year-old boy with AT/RT in the vermis, extending into the fourth ventricle. A, Axial (TR/TE, 600/11) MR image shows the tumor to have mixed intermediate signal intensity as well as irregular zones of high signal intensity secondary to hemorrhage (methemoglobin). B, Axial (TR/TE, 3500/108) MR image shows the tumor to have heterogeneous mixed low, intermediate, and high signal intensity. C, Axial (TR/TE, 500/29) MR image shows contrast enhancement in less than two thirds of the AT/RT. This patient is alive without evidence of disease 9 years after surgery/initial diagnosis. MR images of a 1.3-year-old boy with AT/RT in the right cerebral peduncle. A, Axial (TR/TE, 600/10) MR image shows the tumor to have intermediate signal intensity. B, Axial (TR/TE, 4000/105) MR image shows the tumor to have heterogeneous intermediate-to-slightly-high signal intensity, which includes zones that are isointense or slightly hyperintense to gray matter. C, Axial (TR/TE, 700/22) fat-suppressed MR image shows prominent homogeneous contrast enhancement of the primary lesion as well as abnormal subarachnoid enhancement in the interpeduncular cistern and along the sulci adjacent to frontal lobes (arrows), representing disseminated leptomeningeal tumor. This patient died 4 months after diagnosis. At diagnosis, AT/RTs ranged from 1.2 to 6 cm superoinferiorly (mean, 3.6 cm; median, 3.7 cm) by 1.3–7 cm transversely (mean, 3.8 cm; median, 3.6 cm), and by 1.2–9 cm anteroposteriorly (mean, 3.9 cm; median, 3.3 cm) (Table 3). 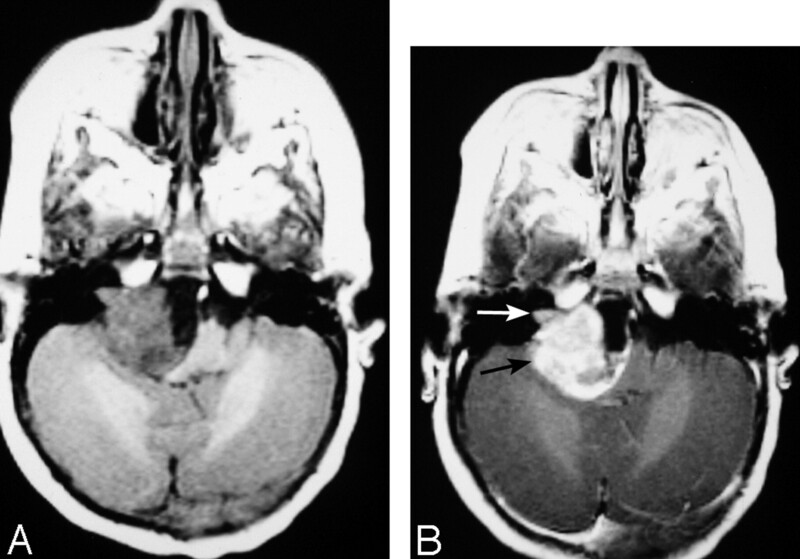 The smallest tumor was located in the midbrain (Fig 3), and the largest lesions were located in the frontal lobe (Fig 4). MR images of 3.4-year-old boy with a hemorrhagic AT/RT in the frontal lobe. A, Sagittal (TR/TE, 520/10) MR image shows a hemorrhagic lesion in the inferior left frontal lobe. B, Sagittal (TR/TE, 600/22) MR image shows edge enhancement of the lesion. C and D, Sagittal (C) (TR/TE, 520/10) and axial (D) (TR/TE, 520/10) MR images obtained 7 months after A, -B show marked interval enlargement of the lesion, which has heterogeneous mixed low, intermediate, and high signal intensity involving the inferior portions of both frontal lobes. E, Axial (TR/TE, 5700/90) MR image shows the tumor to have mixed low, intermediate, and high signal intensity, with evidence of edema in the surrounding brain tissue. F, Axial (TR/TE, 600/22) MR image shows prominent heterogeneous contrast enhancement of the tumor with irregular lobulated margins. This patient underwent partial resection of the AT/RT, subsequently had disseminated leptomeningeal tumor, and died 3.3 years after surgery/initial diagnosis. G, Axial CT image shows the lesion to have intermediate attenuation with multiple calcifications and zones of low attenuation. On short TR images, AT/RT typically had heterogeneous intermediate signal intensity with zones of low (n = 7), high (n = 1), or both low and high (n = 4) signal intensity, resulting from cystic and/or necrotic regions, hemorrhage, or both, respectively (Figs 1, 2, 4, 5, and 7). Foci of high signal intensity secondary to methemoglobin were small except for 1 lesion in the inferomedial left frontal lobe (Figs 2 and 4). One of the hemorrhagic lesions was initially thought to have been a hemorrhagic infarct versus hemorrhage secondary to a cavernous angioma (Fig 4). Subsequent MR imaging 7 months later showed a large intra-axial lesion involving both frontal lobes (Fig 4). MR images of a 4-year-old girl with a constitutional ring 22 chromosome and AT/RT involving the septum pellucidum, with extension into the lateral ventricles. A, Axial (TR/TE, 450/18) MR image shows the tumor to have intermediate signal intensity with several small zones of low signal intensity. B, Axial (TR/TE, 4000/105) MR image shows the tumor to have heterogeneous predominantly intermediate-to-slightly-high signal intensity that is isointense to gray matter, as well as small zones of high and low signal intensity. C, Axial (TR/TE, 450/31) MR image shows irregular heterogeneous contrast enhancement of less than two thirds of the primary AT/RT. This patient had subtotal resection of the tumor and subsequently had locally recurrent disease and disseminated leptomeningeal tumor. She died 14 months after surgery/initial diagnosis. FLAIR images of AT/RT before surgery were available for review for 6 patients. Solid portions of AT/RT had intermediate signal intensity that was isointense (n = 4), isointense and slightly hyperintense (n = 1), or slightly hyperintense (n = 1) relative to gray matter (Figs 8 and 9 and Table 3). On long TR/long TE images, solid portions of AT/RT typically had heterogeneous intermediate-to-slightly-high signal intensity that was isointense (n = 6), or slightly hyperintense (n = 7), and mixed isointense and slightly hyperintense relative to gray matter (Figs 1–6, 8, 9 and Table 3). 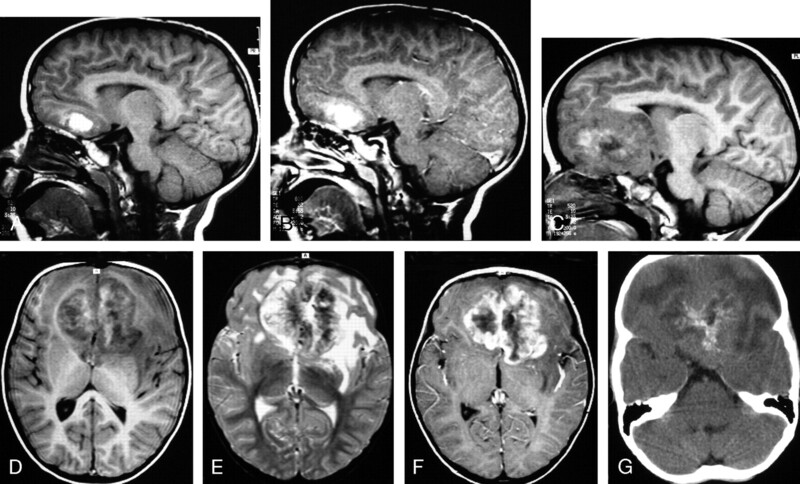 MR images of a 4-month-old female infant with a germ-line mutation of the hSNF5/INI1 gene with synchronous AT/RT, showing contiguous involvement of the pineal gland, dorsal midbrain, and upper cerebellum and a malignant rhabdoid tumor involving the left kidney. A, Sagittal (TR/TE, 570/14) MR image shows the tumor to have predominantly intermediate signal intensity with several small zones of high signal intensity. B, Sagittal (TR/TE, 750/22) MR image shows only minimal contrast enhancement in less than one third of the tumor. C, Axial (TR/TE, 3710/105) MR image shows the tumor to have intermediate-to-slightly-high signal intensity that is isointense to gray matter, as well as a small zone of high signal intensity. Small zones of low signal intensity were also seen in 5 lesions secondary to blood products (n = 4) or calcifications (n = 1) (Figs 2 and 4). Zones of high signal intensity comparable to CSF were seen in 12 of 13 tumors secondary to cystic/necrotic zones with (n = 5) or without (n = 7) hemorrhage (Figs 1, 2, 4–6, 8, 9). Cystic and/or necrotic tumor zones were <2 cm in 8 patients and >2 cm in 4 patients. Signal intensity heterogeneity was related to the relative proportions of cystic/necrotic zones and/or hemorrhage that were also seen on the short TR images. Reports from light microscopy of tumor samples described histologic findings of necrosis and hemorrhage in 10 and 4 of the tumors, respectively. Four patients in this series had preoperative MR imaging that included DWI and ADC imaging. All 4 of these AT/RTs showed hyperintense signal intensity on DWI and hypointense signal intensity on ADC images relative to normal brain parenchyma, indicating restricted diffusion within these tumors (Fig 9 and Table 3). Proton MR spectra were available for review for 1 AT/RT before surgery and for 2 residual tumors after partial resection. All 3 AT/RTs showed elevated levels of choline and decreased N-acetylaspartate. Preoperative CT scans were available for review for 6 patients. Solid portions of the lesions had intermediate attenuation similar to (n = 3) or slightly higher (n = 3) than that of gray matter (Figs 1 and 4). Zones of low attenuation secondary to cystic necrotic changes were seen in all 6 AT/RTs. Calcifications were observed in 3 of the 6 lesions scanned with CT (Fig 4). Findings on Contrast-Enhanced MR Images. All except 1 AT/RT showed contrast enhancement (Fig 8). Regarding the 12 AT/RT that showed contrast enhancement, the fraction of tumor volume showing enhancement was greater than two thirds in 7 patients (58%), between one third and two thirds in 4 (33%), and less than one third in 1 (9%) (Figs 1–7, 9). The enhancement pattern was most often heterogeneous (n = 11, 84%), and homogeneous in only one (6%). Portions of the enhancing margins of AT/RT were ill-defined in 3 patients (Figs 2 and 4). Abnormal enhancement in the intracranial leptomeninges representing disseminated tumor was found in 4 patients at the time of diagnosis (Fig 3). MR images of a 10-month-old female infant with an extra-axial AT/RT in the right cerebellopontine angle cistern, extending into the right internal auditory canal (arrows). A, Axial (TR/TE, 550/14) MR image shows the tumor to have intermediate signal intensity with a zone of low signal intensity medially. B, Axial (TR/TE, 600/22) MR image shows prominent enhancement of the solid portion of the lesion. This patient had subtotal resection followed by chemotherapy and died 1 month after surgery from sepsis related to immunosuppression from chemotherapy. A, Axial (TR/TE, 4000/105) MR image shows the tumor to have heterogeneous intermediate-to-slightly-high signal intensity with regions that are isointense and slightly hyperintense to gray matter, as well as a small zone of high signal intensity. B, Axial FLAIR (TR/TE/TI, 9000/119/2200) MR image shows the tumor to have mostly intermediate signal intensity that is isointense to gray matter. C, Axial (TR/TE, 800/20) fat-suppressed MR image with magnetization transfer shows no contrast enhancement of the primary lesion. This patient had subtotal resection of the primary lesion followed by chemotherapy. The patient had subsequent local recurrence and disseminated leptomeningeal tumor and died 7 months after initial diagnosis. A, Axial FLAIR (TR/TE/TI, 9000/119/2200) MR image shows the tumor to have mostly intermediate signal intensity that is isointense to gray matter. B, Axial (TR/TE, 6000/99) MR image shows the tumor to have mostly intermediate-to-slightly-high signal intensity that is slightly hyperintense to gray matter, as well as small zones of high signal intensity. C, Axial (TR/TE, 800/20) fat-suppressed MR image with magnetization transfer shows prominent slightly heterogeneous contrast enhancement of the tumor. This patient had gross total resection of the primary lesion followed by chemotherapy and has been disease-free for 4 years. D, Axial DWI (b = 1000) shows the lesion to have high signal intensity. E, Axial ADC map shows low signal intensity in the lesion, indicating restricted diffusion of water within the AT/RT. Patient Outcomes and Findings on Postoperative Contrast-Enhanced MR Images. Thirteen patients (76%) have died from 1 month to 12.5 years (mean, 2.3 years; median, 1.3 years) after diagnosis. Only 3 of the 13 patients who died had undergone gross total resections (Table 1). Other factors associated with a poor prognosis were young age at diagnosis and presence of disseminated leptomeningeal tumor. Patients who died had mean and median ages of 2.4 and 1.7 years at diagnosis, respectively, compared with the surviving patients whose mean and median ages were 8.1 and 7 years at diagnosis, respectively (P = .009, Mann-Whitney U test). Ten of the 13 deceased patients had MR imaging evidence of disseminated leptomeningeal tumor at the time of diagnosis (n = 4) or in the subsequent postoperative period (n = 6). The 4 patients who had disseminated tumor in the leptomeninges at diagnosis died from 4 months to 5.1 years (mean, 2.1 years) later. Only 1 of these patients had a reported gross total resection of the primary tumor. The other 6 deceased patients with disseminated disease had evidence of subarachnoid tumor on MR images from 3 months to 2.8 years (mean, 1.1 years) after surgery and earlier negative findings on imaging examinations. Only 2 of these patients had gross total resection of the primary tumors. These 6 patients also had MR imaging evidence of residual or locally recurrent tumor before (n = 3), contemporaneous with (n = 2), or after (n = 1) detection of disseminated leptomeningeal tumor with MR imaging. One of these patients also had extension of disseminated intracranial subarachnoid tumor into the peritoneal cavity via a ventriculoperitoneal shunt. The presence of disseminated leptomeningeal tumor seen with MR imaging was significantly associated with patients’ deaths (P = .002, Fisher exact test). For patients who died with MR imaging evidence of leptomeningeal tumor, contemporaneous CSF cytology was positive in 56%. None of the patients who died had CSF cytology positive for tumor cells without MR imaging evidence of disseminated tumor. Of the 3 remaining deceased patients, 1 died from sepsis related to immunosuppression from chemotherapy. Another patient was a 4-month-old female infant with a germ-line mutation who had intracranial AT/RT as well as a malignant rhabdoid tumor in the left kidney. This patient died 6 weeks after diagnosis from metastatic pulmonary lesions from the malignant renal rhabdoid tumor (Fig 6). The third patient was 3.4 years old at diagnosis and died 12.5 years later after 3 local recurrences, despite 3 surgeries and multiple cycles of chemotherapy. The 4 patients who are alive have follow-up intervals ranging from 4 to 11.5 years (mean, 8.4 years; median, 9 years) after surgery. Surviving patients ranged from 3.2 to 15 years at the time of diagnosis. Three surviving patients had gross total surgical resection, and the other had a subtotal resection. One of the surviving patients had postsurgical radiation, and 3 had both radiation and chemotherapy. The 3 patients who had gross total resections have had no evidence of residual or locally recurrent tumor or disseminated neoplasm by MR imaging or CSF cytology in follow-up periods ranging from 4 to 11.5 years (mean, 8.5 years) after surgery. The single surviving patient who had a subtotal resection has been disease-free 7 years after a complete response for minimal residual local disease. A variety of cytogenetic abnormalities involving chromosome 22 have been found in AT/RT, typically resulting in monosomy 22 or deletions involving band 22q11.2.1,3,5–9,10–13,15,16 Deletion of 22q11.2, most often detected by fluorescence in situ hybridization, results in loss of the hSNF5/INI1/SMRCB1/BAF47 gene.4–7,12,13,16 Molecular genetic analysis of tumor tissue demonstrates deletion and/or mutation of hSNF5/INI1 in approximately 70% of AT/RTs.4–7,12,13,16 Inactivation of this gene is also diagnostic of rhabdoid tumors of the kidney and other extrarenal sites.8,12,13,16 The hSNF5/INI1 gene codes for an essential component of the SWI/SNF ATP-dependent chromatin remodeling complex.4,7,10,12,13 Functional studies have shown that hSNF5/INI1 may activate and repress target genes, though the specific role of this gene in tumor suppression has not yet been elucidated.4,7,10,12,13 All 7 AT/RTs tested in our study had deletions and/or mutations of this tumor-suppressor gene, and all 4 patients tested had loss of nuclear expression of the protein by immunohistochemistry, confirming the diagnosis of AT/RT. In the current study, calcifications within AT/RT were seen in half of the patients who underwent preoperative CT. Similar CT findings have been reported previously.27,29,32 AT/RTs show various patterns and degrees of gadolinium contrast enhancement, which are features that have been reported for PNET.38,39 In addition, the proton MR spectra of AT/RT and PNET typically show elevated levels of choline and decreased N-acetylaspartate.38,40 Similarities of many imaging features of AT/RT with PNET likely prevent reliable discrimination of these neoplasms based solely on MR imaging data. AT/RTs are rare malignant intracranial neoplasms usually occurring in young children. AT/RTs have aggressive growth with high potential for dissemination within the CNS. These tumors have been misdiagnosed in the past as PNET/MB because of frequent overlapping histologic and imaging features. AT/RT can now be distinguished from PNET/MB by using specific immunohistochemical markers (EMA, vimentin, actin, hSNF5/INI1) and mutation analysis. Confirmation of the diagnosis of AT/RT is important because these tumors typically have a poor prognosis that is worse than that in PNET/MB, necessitating new intensified therapies. AT/RT was found to be mostly intra-axial (94%) except for 1 extra-axial lesion seen in the cerebellopontine angle cistern. AT/RT can be infra- and/or supratentorial. The unenhanced and enhanced MR imaging features of AT/RT are often variable secondary to cystic/necrotic changes and/or hemorrhage. Disseminated tumor in the leptomeninges was seen with MR imaging in 24% of patients at diagnosis/initial staging and occurred in another 35% from 4 months to 2.8 years after surgery and earlier imaging examinations with negative findings. The overall 1-year and 5-year survival probabilities were 71% and 28%, respectively. Factors associated with poor prognosis were young age at diagnosis (P = .009) and MR imaging evidence of disseminated leptomeningeal tumor (P = .002).